I have fallen in love with Tofu Shirataki noodles. They’re packed full of fiber and calcium and have such a low calorie count they are almost an afterthought. I’ve been using them lately in everything and wanted to spread the word to those of you who may be looking for interesting and less caloric pasta choices. They have a somewhat squidgy texture, but they’re soft unlike kelp noodles which are crunchy and brittle-textured. Here I tossed them with some quickly sautéed kale [we have to get in our daily cruciferious fix! 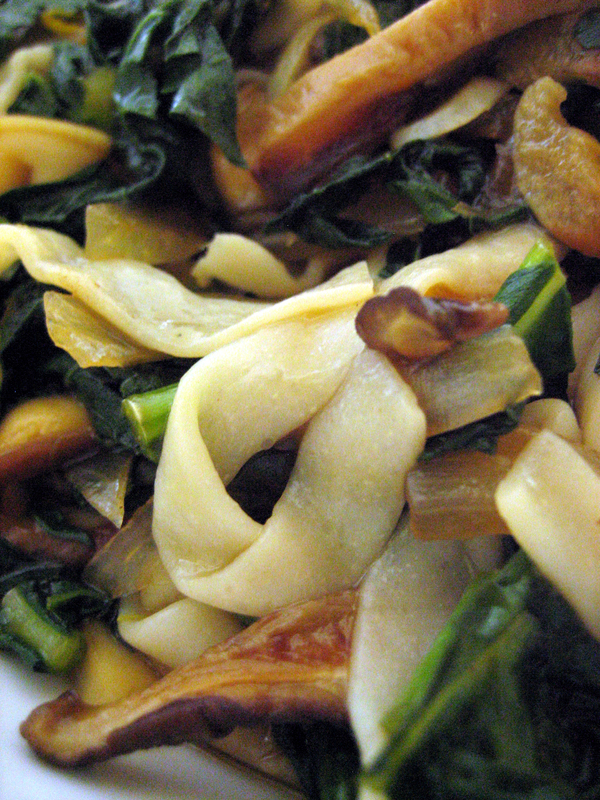 ], shiitakes and garlic in a really quickly freshened Asian-style sauce. Add a couple teaspoons of neutral oil to a sauté pan and bring to a medium heat. Add the mushrooms and onion. Sauté until softened. Add the orange juice, zest and vegetarian oyster sauce to a small pan and bring to a low simmer. Allow this to simmer and reduce slightly while the vegetables cook. Put a pot of water on to boil to heat the noodles. Add the garlic and kale to the pan containing the mushrooms and onions. Once the kale has wilted down [should take about 10 minutes], add the sauce and set aside. Rinse the noodles under running water and then add to a pot of boiling water. Boil for 2-3 minutes. Drain and toss with the vegetables and sauce. That looks incredible! I just discovered shiratake, and I’m in love with them, too! Right on Gail 🙂 I completely dig them too. They’ve become my go-to noodle to bulk up vegetable dishes and to use in traditional pasta dishes.